When it comes to hyperinflation, we can measure it with great accuracy. But, it is impossible to produce meaningful hyperinflation forecasts. During episodes of hyperinflation, their courses and durations change so rapidly, and so dramatically, that predictions are a fool’s errand. Indeed, hyperinflations are so unstable and unpredictable that even forecasting the inflation rate for a coming month with any degree of accuracy is impossible. However, this has not deterred the International Monetary Fund (IMF). The IMF repeatedly produces forecasts (read: finger in the wind guesses) of Venezuela’s inflation rate. These guesses appear regularly in the IMF’s bi-annual World Economic Outlooks (WEO). What does not appear in the WEO reports, however, are inflation measurements. Just how looney are the IMF’s guesses? To answer that question, consider that the IMF forecast for Venezuela’s 2018 year-end annual inflation rate is 12,874.6%. On May 30th, I accurately measured Venezuela’s annual inflation rate, and for the first time, it breached 25,000%, and today, May 31st, it sits at 27,364% (see chart below). That’s more than double the IMF’s year-end inflation forecast, and there are still seven months left to go until year-end. And this is only one example of the IMF’s carelessness. In the same April 2018 WEO report, the IMF forecasts that Venezuela’s inflation rate at the end of 2019 will be exactly the same as the IMF estimate for the end of 2018, namely 12,874.6%. And when I say “exactly,” I mean “exactly.” Down to the last decimal point. Talk about spurious accuracy. Why does the IMF’s carelessness matter? After all, who cares if the IMF is delivering faulty forecasts? Well, the financial press should care. The Central Bank of Venezuela no longer reports annual inflation rates. So, there is no official Venezuelan source for information on what is, in fact, currently the world’s highest inflation rate. So where can the financial press turn for an “official” number? As is often the case, the press turns to the IMF. The problem is that the press, for the most part, merely reports the IMF’s forecasts, without so much as a mention of the fact that inflation forecasts during an episode of hyperinflation are nonsense. So, where can we find accurate measurements of Venezuela’s hyperinflation? There are two ways to measure inflation during episodes of hyperinflation. One way, which is practical, accurate, and cost-effective, is to employ Purchasing Power Parity (PPP) theory. That’s what I do. 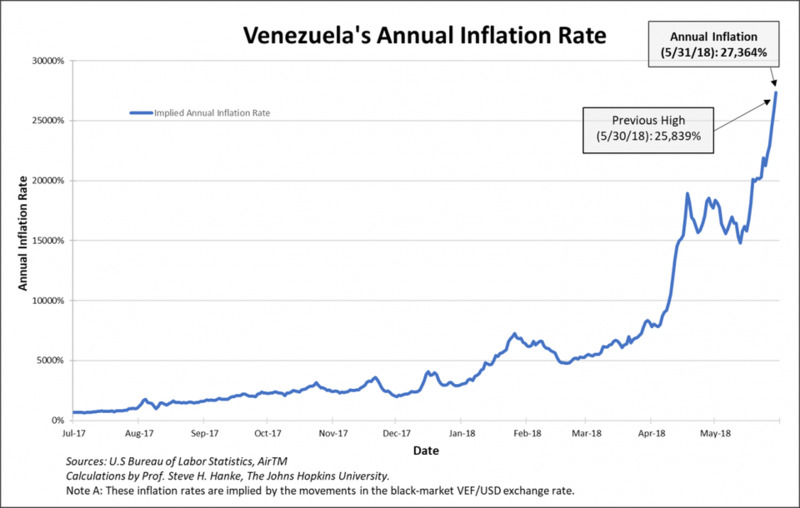 Using high-frequency, black-market exchange rate data, I am able to calculate an implied annual inflation rate for Venezuela on a daily basis. The PPP approach has time and again proven to be extremely accurate in hyperinflationary environments. The Grim Reaper has taken his scythe to the Turkish lira. The hapless lira has already lost 15% of its value this month. The lira’s plunge is depicted in the chart below. The Grim Reaper has taken his scythe to the Iranian rial (see chart below). The Islamic Republic of Iran remains in the ever-tightening grip of an economic death spiral. The economy is ever-vulnerable because of problems created by the last Shah, and added to massively by the theocratic regime. President Nicolas Maduro is here to stay - at least for a while. After winning a landslide ‘election,’ with over two-thirds of the vote, Maduro will remain in the saddle for another five years, in principle.